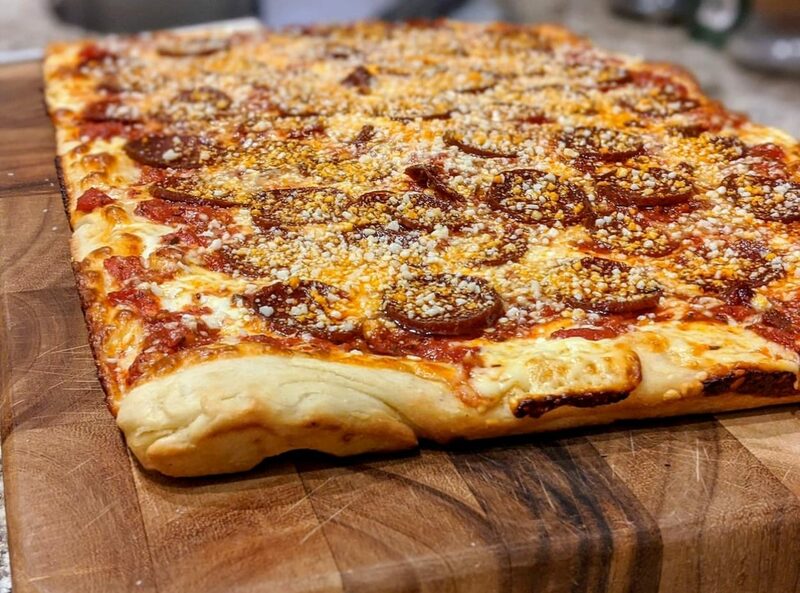 One of the absolute best pizza recipes you can find. Time and time again this easy to assemble, easy to bake pizza has *wowed* us and guests. It will definitely leave you wondering where it all went as it gets gobbled up quickly. If your home is cool or cold the dough can take a very long time to rise. Use your oven's proofing option if available or improvise. We have only ever done the food processor method for making the dough which has always worked out. Margherita natural casing was the preferred pepperoni due to how well it curled and the overall texture. Boar's head was a close second but we felt should be cut thinner. Use a high quality rimmed baking sheet, preferrably with ridges on the base. If the pizza is sticking after baking and you followed the recipe exactly it could be due to the baking sheet. Hand slicing the pepperoni provided the most consistent results. A mandolin was too difficult to use with the pepperoni. Our oven only goes up to 450 degrees, although it seems to run hot, and without a baking stone we have produced great, crispy crusts.